Emsley, John (2001). "Uranium". Nature's Building Blocks: An A to Z Guide to the Elements. Oxford: Oxford University Press. pp. 476–482. ISBN 0-19-850340-7. Seaborg, Glenn T. (1968). 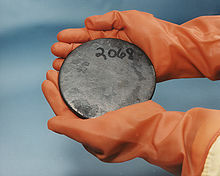 "Uranium". The Encyclopedia of the Chemical Elements. Skokie, Illinois: Reinhold Book Corporation. pp. 773–786. LCCCN 68-29938.